NTERRA and mouse MEF cell lysates; Human prostate tissue; HeLa and U251 cells. Our Abpromise guarantee covers the use of ab173817 in the following tested applications. WB 1/500. Predicted molecular weight: 51 kDa. IHC-P 1/100 - 1/400. Perform heat mediated antigen retrieval with citrate buffer pH 6 before commencing with IHC staining protocol. Immunofluorescent analysis of formalin-fixed, permeabilized HeLa cells, labeling GATA2 with ab173817 at 1/200 dilution (green). Cells were washed with PBST and incubated with a DyLight-conjugated secondary antibody. F-actin (red) was stained with a fluorescent phalloidin and nuclei (blue) were stained with DAPI. Immunohistochemical analysis of Human prostate tissue, labeling GATA2 with ab173817 at 1/100 dilution (right image). Detection was performed using a secondary antibody conjugated to HRP. DAB staining buffer was applied and tissues were counterstained with hematoxylin. Immunofluorescent analysis of formalin-fixed, permeabilized U251 cells, labeling GATA2 with ab173817 at 1/20 dilution (green). Cells were washed with PBST and incubated with a DyLight-conjugated secondary antibody. F-actin (red) was stained with a fluorescent phalloidin and nuclei (blue) were stained with DAPI. Immunofluorescent analysis of formalin-fixed, permeabilized Human cells, labeling GATA2 with ab173817 at 1/100 dilution (green). Cells were washed with PBST and incubated with a DyLight-conjugated secondary antibody. F-actin (red) was stained with a fluorescent phalloidin and nuclei (blue) were stained with DAPI. Immunofluorescent analysis of formalin-fixed, permeabilized HeLa cells, labeling GATA2 with ab173817 at 1/200 dilution (green). 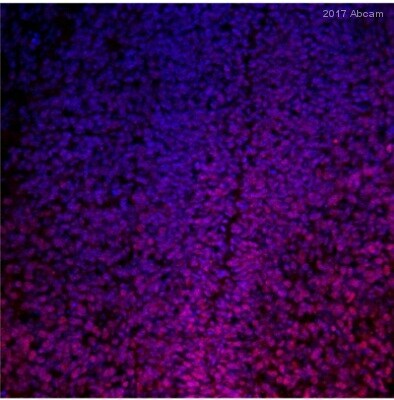 Cells were washed with PBS and incubated with a DyLight-488 conjugated secondary antibody. Nuclei (blue) were stained with Hoechst 33342 dye. Publishing research using ab173817? Please let us know so that we can cite the reference in this datasheet.